I'm not a rice person. As far as starches go, it's my least favorite. But Brooklyn Commune and is making me rethink that with their new Vietnamese Rice Salad. . . This $9 salad, makes a substantial meal. 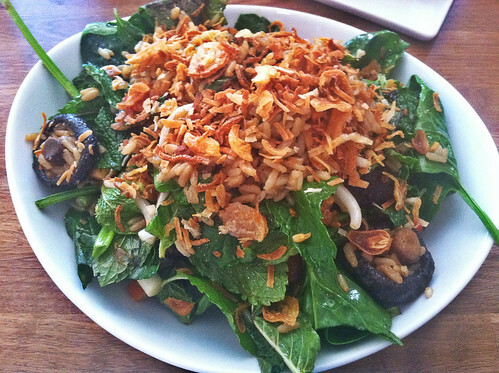 It's loaded with seasoned rice, spinach, shiitake mushrooms, thai basil, lemon-soy vinaigrette, toasted coconut, crispy shallots. This past summer I fell in love with Brooklyn Commune's Organic Kale Salad ($9), a close cousin to a Kale Caesar, made with kale, radicchio with shaved Manchego and anchovy dressing. To say I was bereft when the kale salad came off the seasonal menu, is to put it mildly. But...this rice salad is amazing. So many mushrooms! Crispy shallots! Mint! I can't wait to go back and have this again. Oh..This look delicious..I like to have one of this freshly cook.